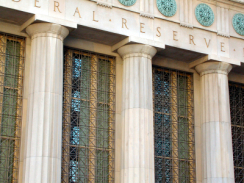 COMMENTARY The Federal Reserve statement today is very similar to the press release from its last meeting in mid December with one notable exception. The Fed announced a commitment to "maintain a highly accommodative stance for monetary policy" by keeping the federal funds rate at "exceptionally low levels" at least through late 2014. The previous policy was to keep rates low through "at least through mid-2013," so this extends the commitment by a year and a half and represents an easing of policy (I would have preferred more aggressive easing, it's not clear how much effect extending the commitment will have -- I don't expect it to be large -- but this is certainly a step in the right direction). As for the tone of this statement relative to the statement in December, there is not much of a difference. There are a few minor changes, for example the statement about business investment is slightly more negative this time, and the committee dropped a statement about continuing to monitor inflation and inflation expectations closely (the "subdued outlook for inflation over the medium run" is one of the reasons the Fed decided to ease policy further), but beyond the change described above the two statements are very similar. Press Release, January 25, 2012 , Federal Reserve Board: Information received since the Federal Open Market Committee met in December suggests that the economy has been expanding moderately, notwithstanding some slowing in global growth. While indicators point to some further improvement in overall labor market conditions, the unemployment rate remains elevated. Household spending has continued to advance, but growth in business fixed investment has slowed, and the housing sector remains depressed. Inflation has been subdued in recent months, and longer-term inflation expectations have remained stable. Consistent with its statutory mandate, the Committee seeks to foster maximum employment and price stability. The Committee expects economic growth over coming quarters to be modest and consequently anticipates that the unemployment rate will decline only gradually toward levels that the Committee judges to be consistent with its dual mandate. Strains in global financial markets continue to pose significant downside risks to the economic outlook. The Committee also anticipates that over coming quarters, inflation will run at levels at or below those consistent with the Committee's dual mandate. Voting for the FOMC monetary policy action were: Ben S. Bernanke, Chairman; William C. Dudley, Vice Chairman; Elizabeth A. Duke; Dennis P. Lockhart; Sandra Pianalto; Sarah Bloom Raskin; Daniel K. Tarullo; John C. Williams; and Janet L. Yellen. Voting against the action was Jeffrey M. Lacker, who preferred to omit the description of the time period over which economic conditions are likely to warrant exceptionally low levels of the federal funds rate.